A New Map of Antient Italy, together with the Adjoyning Islands of Sicily, Sardinia, and Corsica, Shewing their Principal Divisions, Cities, Towns, Rivers, Mountains etc. 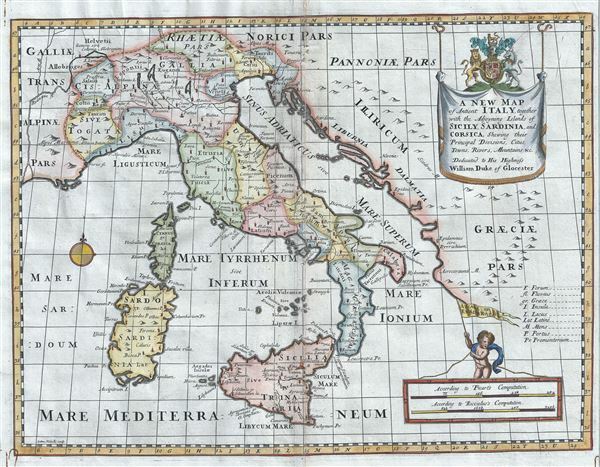 This is an uncommon 1712 map of ancient Italy inclusive of the adjoining islands of Sardinia, Corsica and Sicily by Edward Wells of Oxford. It covers all of Italy in the days of the Roman Empire from Cisalpine Gaul to Sicily, noting towns, cities, rivers, mountains, islands and other topographical features. The map identifies a host of important cities and towns and uses ancient names throughout. The Roman regions of Latium, Etruria, Lucania, Apulia and Campania are also noted. Latium is the region of central western Italy in which the city of Rome was founded and grew to be the capital city of the Roman Empire. This land was originally where the tribe known as the Latins resided. Campania is a region in southern Italy that, during the Roman Era, was highly respected as a place of culture by the Emperors, where it balanced Greco-Roman culture. During the first centuries of the Imperial Rome, Italia was the territory of the city of Rome rather than a Roman Province. As such Italia enjoyed a special status such that the armies of military commanders were not allowed into the region. Very good. Some creasing and toning along original centerfold, with some discoloration. Rust marks in top and bottom left margins.